There’s a reason why more than 45,000 students call Ann Arbor home. Beyond the prestigious University of Michigan and football games at The Big House (Go Blue! 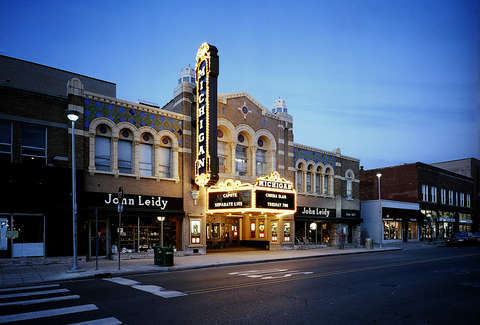 ), this city boasts many museums, beautiful parks, a vibrant craft beer scene, and a certain famous sandwich shop. But even all that is barely scratching the surface of what A2 has to offer. Whether you’re a repeat visitor looking for some new spots to spend your weekend or a first-timer wanting to experience Ann Arbor a bit more “off the beaten path,” there’s much to eat, drink, and do within these 28 square miles. Here are some of the city's best hidden treasures to explore. For a twist on the classic burger-and-shake combo, head to this Cuban-inspired street food eatery downtown. The name refers to its two main menu items: The frita, a burger made from spicy chorizo, topped with shoestring fries, and sandwiched in a soft egg bun; and the batidos, tropical milkshakes made with fresh fruit, crushed ice, and vanilla ice cream from area favorite Guernsey Dairy (plus a splash of dark rum, if you’d like, for the low price of $1). 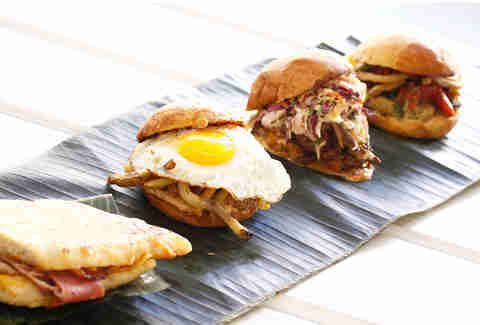 The gourmet burgers and colorful, umbrella-topped drinks are served in a retro-cool white brick space that begs to be added to your Instagram feed, and the dining is community-style on picnic benches, creating a boisterous atmosphere where you can strike up a conversation with whoever else is sitting at your table. If you’ve heard one thing about the food in Ann Arbor, it’s probably Zingerman’s Deli. The Kerrytown market has been around since 1982 and is a local institution, often with a line out the door for its sandwiches generously piled with corned beef, pastrami, turkey, and other sliced meats. And while it certainly deserves the hype, consider mixing up your Zingerman’s patronage with a visit to the newest eatery in its empire, Miss Kim. The Korean restaurant opened a few doors down from the famous deli in 2016, and is led by female chef-owner Ji Hye Kim, who grew up in Seoul. The menu features Korean street food staples like banh mi and pork buns, traditional dinner entrees such as Korean fried chicken and bibimbop (with steak or mushrooms), and other dishes adapted to showcase local farmers, butchers, and purveyors, like chili butter Michigan lake trout. Open since 1988 (in a building that dates way back to 1876), Amadeus is a taste of old-world Europe in the heart of downtown. The Central European restaurant is styled after traditional Viennese cafes, serving hearty Polish, Hungarian, and Austrian comfort food dishes. If you’re looking for order recommendations, try the gołąbki (rice & pork-stuffed cabbage rolls), kielbasa, pierogi (choose from sweet cheese, pork, mushroom, potato & American cheese, sauerkraut, or potato & farmer cheese fillings), paprikash (shredded chicken stew), goulash (beef stew), or bitki with kopytka (pork tenderloin with dumplings). Even if you don’t make it for dinner, it’s worth a stop just for the dessert: the chocolate gateau, sacher torte, Napoleon, and Polish poppy seed cake are all amazing. Finish it off with a Viennese coffee served with caramel, whipped cream, and cinnamon if you’re feeling truly decadent. There’s also live, classical music on weekends (piano & acoustic guitar), providing a relaxing soundtrack to your meal. Every city has a trendy ice cream parlor these days (Ann Arbor included), but there’s something to be said for tradition, and Washtenaw Dairy is THE classic scoop shop. Open for more than 75 years on the Old West Side, the shop (which also serves donuts) is so well-known, they didn't even bother to hang a sign for more than 45 years -- you could just ask people to point you to “the Dairy.” They’re open 364 days a year (sorry, guys, no ice cream on Christmas), from 5am to 10pm, and whenever you go, come with your appetite -- this place scoops the biggest single-serving in town. Stopping by Fleetwood Diner after a bar crawl is basically an Ann Arbor rite of passage. Order their specialty, the Hippie Hash: a generous portion of hash browns topped with grilled green peppers, onions, tomatoes, broccoli, and mushrooms, and finished off with a mess of feta cheese that melts on top. Just prepare yourself to wait a while for your food -- even if you’re the only people there. Artisan coffee shops are a dime a dozen these days. To change up your caffeine routine, head to this tea shop and cafe across from the Ann Arbor Hands-On Museum, which has the best selection of loose tea in town (and possibly the whole county). 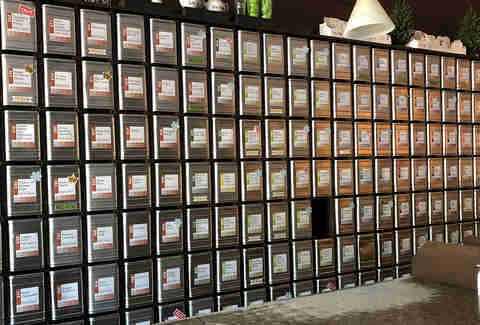 Dozens, if not hundreds of teas from all over the world are curated by TeaHaus’ own tea sommelier, Lisa McDonald. The teas come from Germany, known to have the strictest quality control standards, and include many varieties of black, oolong, green, white, rooibos, herbal, and more. Their cafe also offers a full English tea service, including finger sandwiches, soup, scones, dessert, and all the tea you can drink for about $30 per person. Bask in the university-life atmosphere at Dominick’s, located across from the U of M law quad. While they do serve food (pizza, Italian sandwiches, pub grub), you’re really here for the sangria. Served in mason jars over ice, the concoction is deliciously drinkable and essentially the unofficial beverage of Ann Arbor summers (though the recipe is a closely-guarded family secret). Post up on the two-story outdoor patio, instruct your server to keep the sangria coming, and relive your college days. Marked by just a simple sign that says “Bar” on the door, 327 Braun Court is easy to miss. But once you step inside the building off North Fourth Avenue, you’re rewarded with one of the most inventive cocktail menus in town served in a relaxed atmosphere. 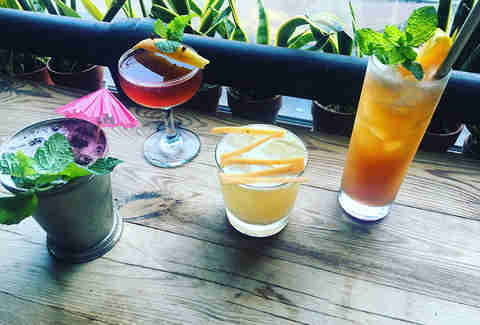 The drinks rotate with the season, and during summer include a Negroni Variation (Laird’s apple brandy, cynar, sweet vermouth), a Mescal Old Fashioned (Vida mescal, maraschino, Angostura bitters), and a Peaty Colada (scotch, pineapple, coconut cream, and lime). There’s even a large selection of board games to occupy you while you sip. Ann Arbor has no shortage of craft breweries: Arbor Brewing Company and Grizzly Peak were two of the state’s first brewpubs and are still justifiably popular, and in more recent years they’ve been joined by the likes of Blue Tractor and Jolly Pumpkin. But if you want to think more small-batch, check out Biercamp, a microbrewery and meat shop located in a small building across from the U of M golf course. All the beers are brewed in-house (on tap now: a Vienna IPA, saison, double IPA, and Belgian brown) and available by the pint, half-pint, or in growlers to go. Pair with one of their handmade sausages and enjoy both in the (also tiny) outdoor beer garden. 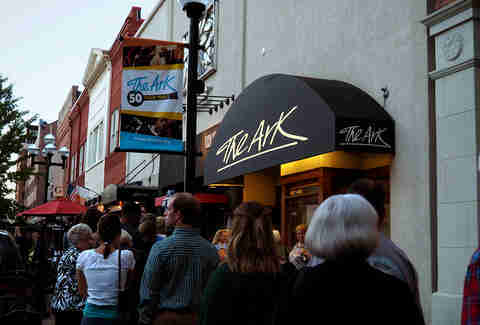 Music fans would be remiss not to see a live show at The Ark, one of the country’s best listening rooms. The venue has been open since 1965 and operates as a nonprofit, which means ticket prices are kept fairly low (many shows cost just $25-$35). The music is focused on indie folk, alternative, and international acts, and the Ark often hosts open mic nights and charity benefits. (Upcoming shows include Shawn Mullins, Antigone Rising, and Robben Ford.) The 400-person capacity venue is intimate, with no bad seats; stellar acoustics mean that anywhere you sit, you’ll feel like you’re in the front row. Oh, and if you want an alcoholic beverage, you have to be a member. BUT, you can sign up right at the theater (an intro membership starts at just $5) and help support the Ark’s mission. When the weather permits, renting a kayak or tube and floating down the Argo Cascades is a great way to explore Ann Arbor by water instead of on foot. The most popular course is a 3.7-mile stretch of the Huron River that will take you about one and a half hours, and there’s a longer 5.7-mile/two-and-a-half-hour course as well. (Though it could take longer on a low tide day). One- and two-person kayaks, five-person rafts, tubes, and stand-up paddle boards are all available to rent at the Argo Livery, and will cost you $10-$20 for two hours of paddle time. On sunny weekends, don’t expect to be the only person with this idea, but it’s worth it to brave the crowds to take in the scenery by float. 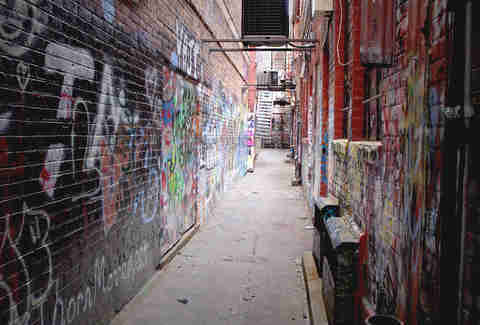 One of the most interesting spots to walk past in Ann Arbor is this alleyway of graffiti tucked off East Liberty Street downtown, next to the Michigan Theater. What originally started as a commissioned mural by artist Katherine Cost in 1999 has been covered with ever-changing graffiti over the years as local street artists left their marks. Walk through and pose for a photo -- just be careful not to lean against the chewing gum wall. This 8,500-square-foot, three-level consignment shop in Kerrytown is a flea market fiend’s dream. Treasure Mart has been open since 1960 and stocks a range of antiques, furniture, vintage items, and plenty of inexpensive kitsch. Even if you’re not shopping, it’s fun to go here just to browse the vast selection. The stock rotates pretty frequently, so you're guaranteed to find something new each time you go. (Though make sure to leave your backpack at home, they’re not allowed). In a rarity for a downtown shop, they have their own parking lot, too -- so feel free to bring your car and stock up. Located on U of M’s North Campus is this piece of landscape art, whose grassy undulations are a physical representation of a mathematical sine wave. (Takes you back to high school physics, right?) It was designed by artist Maya Lin (of the famed Vietnam War Memorial in DC) and installed in 1995 as a memorial to Francois-Xavier Bagnoud, whose name adorns the aerospace engineering building next door. One cool thing about the earthen sculpture is that its peaks and valleys cast different shadows depending on the time of day and year, so the look will change depending on when you visit. Come to the wavy, grassy lawn to sit and watch the clouds go by, cuddle with a date, or game-plan your next stop.